Take a unique approach to gardening with an oval metal garden bed. If you want to garden, but don't want the commitment, we have a solution for you: a metal garden bed. The oval design provides you with a unique approach to planting. You can easily grow vegetables, herbs, or flowers without putting in an enormous amount of time like you would with a standard garden. The metal garden bed is a great small space gardening solution. If you live in an apartment or condo, use the planter on your balcony or rooftop (if you have space). Paired with a galvanized finish, this raised metal garden bed will be a great addition to your outdoor decor. Use it to create a patio border! Metal garden bed is 100% iron, 0.6 mm thick and has a galvanized finish. 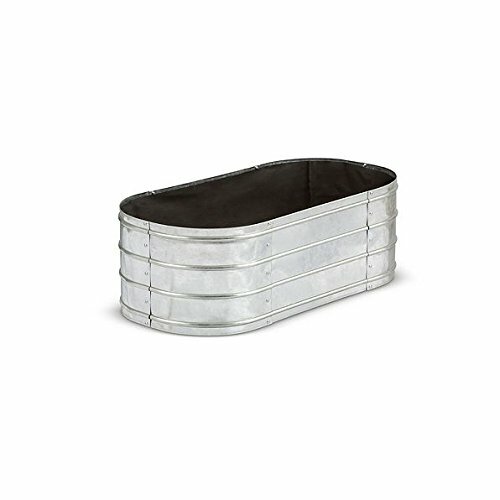 Planter comes with a polyester non-woven liner and four metal clips. The metal garden bed is a great small space gardening solution. If you live in an apartment or condo, use the planter on your balcony or rooftop (if you have space). You can easily grow vegetables, herbs, or flowers without putting in an enormous amount of time like you would with a standard garden.